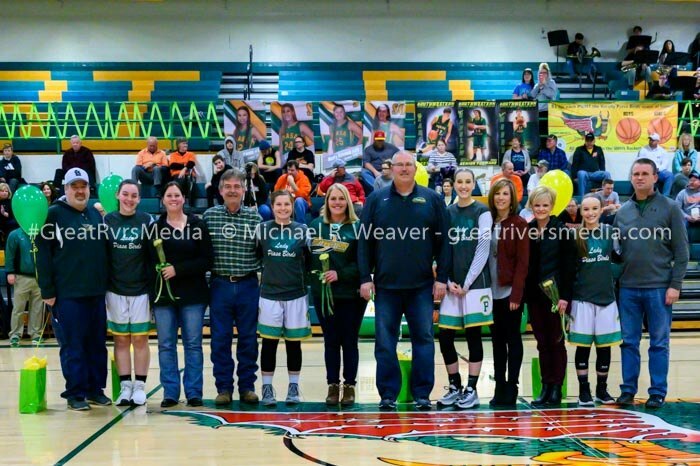 Southwestern senior girls basketball players and families were recognized during the Southwester vs. Hillsboro game. PIASA - Southwestern recognized senior girls – Molly Novak, Abby Burns, Lexi Hall and Bailey Weible last week. Southwestern head girls coach Steve Wooley said his senior girls have worked “really hard” this season and meant an incredible amount to the Piasa Birds’ girls basketball program over the years. “We have been mixing our sophomore class in with the seniors, starting three sophomores,” he said. “The seniors come off the bench and show their leadership. We did play Hillsboro, a good team, right down to the wire. Hall led the Birds with 15 points on Senior Night, Rylee Smith had 11 points and Weible added 10. Wooley has high hopes for the Piasa Birds in the Southwestern Regional and said having the home court advantage will be helpful. “Carlinville and Hillsboro both have won 20 games and we have won 20-plus, so it will be a pretty competitive regional,” Wooley said.